We want your pets to spend their time with us in contented ease, relaxed and laid back. Unless you tell us differently we provide three brands of dried food: Hills Science, Lams and Go-Cat, which are available at all times. Wet food is provided twice daily (sachets or foils, no tins unless you prefer). Please advise of any special requirements. We like to follow your cat's home routine as closely as possible, it's in our best interest as well as your cat's to follow your instructions. If your cat likes to be groomed please bring your own brush or comb. Most cats like some attention and this is a great way to focus on them. 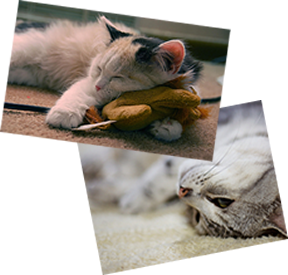 We try to create a tranquil, comfortable and secure environment and have everything here that your cat needs, but feel free to bring something familiar from home such as a blanket, old slipper or a favourite toy. © Barnt Green Boarding Cattery 2019. All rights reserved.